Baseball, back in 1856 was named "Americas favorite past time". Today is is played by children to adults, with a few select playing the game professionally. Speed, agility, strength, and quick thinking are all qualities of a well rounded player. Ball handling skills such as catching and throwing are always being perfected. Some even say hitting a baseball with a bat may be the hardest thing to do out of all sports. This page will offer you tips and training ideas as well as quality links to training and conditioning plans regardless of you current level of play. A competitive player should always try to improve their skills and playing abilities depending on the positions they play. are all skills that need to be worked on. Here we will focus on the physical level of play and the enhancement of Speed, Quickness, and Power, all important physical attributes of a well conditioned player. After the testing is done, conditioning program that incorporates exercises, running, and strength training should be started that lasts from 5-7 weeks. Work out 3 days each week. At then end of the training period we post test to measure improvement. If you're interested in baseball training, feel free to read about Jon Doyle's insights on baseball specific training and baseball exercises. 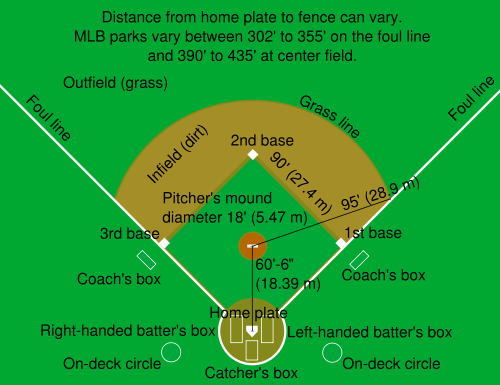 For additional baseball information visit 2 create a baseball player..
To return from the Baseball page to the Sports Training page click HERE.